The Native American motif is a very popular go-to genre for slots game makers and there are a number of games with this theme on the market and available for play, with a good many of them remaining very popular among land-based gamers and online players. Ainsworth is the designer of this Winning Wolf slots game. It is significantly different than the other games in this genre and that makes this one worth your while to give it a try. This game boasts 50 paylines and a bonus round that includes a Sticky Wild feature that is represented by the Wolf. Even though this online game does not have the feel of the land-based Vegas version of the original, it still has the smooth and faultless operation of an Ainsworth proudly produced product. All the graphics are nicely detailed in bright and attractive colors with attention paid to the smallest detail, especially well done are the mountains, the buffalo, the wolf and the eagle. The exception to this rule is probably the squirrel. It is sandwiched between much more predatory animals on the reels, and that makes its positioning look very much out of place or that the designer was not paying attention to the overall panorama of the playing screen. There is one animation by the wolf that is a bit too stereotypical, for example, when he howls from an elevated rock position after a win by the player. The audio is only average and is comprised of overly-used “computer-generated jingles” found in desktops in days of old. The sound effects include the click-click sounds of the spinning reels, but the sound effects repertoire need to be greatly expanded to add depth to the overall atmosphere. The Free Spins bonus is slow to trigger during base play, however, the Sticky Wilds did result in many winning opportunities, particularly towards the end of the play. The game is framed on 50 available paylines, although you have a choice of selecting 40, 25, 10, or 1 as a substitute if you like. Many game strategists opt to select all 50 paylines for every spin because that increases the chances that you will trigger the Sticky Wilds feature during base play using the Free Spins option. The minimum bet is NZD0.02, so it is possible to play all 50 paylines starting with NZD1 and higher. The maximum bet is NZD6.50 per payline or NZD325 for each spin. 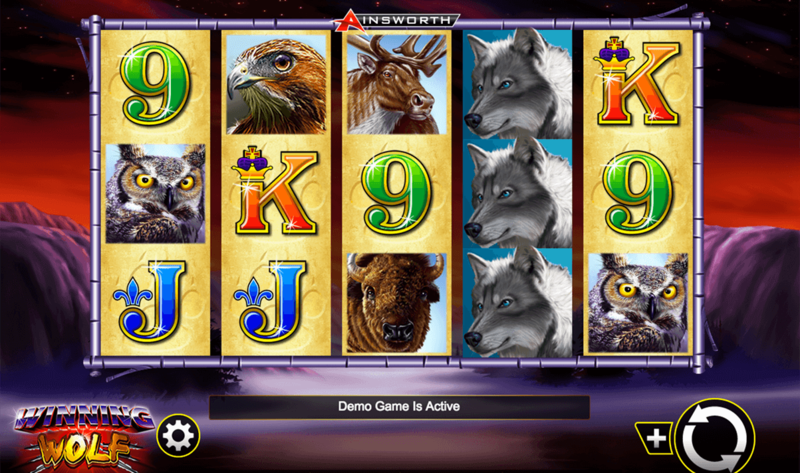 Typical on all Ainsworth slots is the ability to Auto-play and gamble after a successful win. Eagles represent the symbol that pays the largest prize among the standard symbols as they are valued at 1,000 coins for 5 eagles and for 4 eagles you get 100 coins. After the Eaglescome to the Buffalo, which will earn you 300 coins for 5 of the great animal symbol. The Owl and Squirrel come next at 200 coins each.Then there is the playful Deer which is worth 150 coins. The standard poker cards such as 10, J, Q, K, and A, in ascending order, bring up the rear. The mighty Wolf represents the Wild icon. It will likely appear stacked on as much as all 3 rows on the spinning reels. The is an easy way to trigger numerous winning combinations during base play. As the Wild, the Wolf can substitute for all other less powerful symbolsexcept for the more powerful Scatter, which is represented by the sacred Mountain. When the Wild Wolf substitutes for other symbols on the screen it does so in an effort to create additional winning combinations, thereby potentially increasing the take for the player. Five Scatter Mountains located anywhere on the screenwill earn you 100x your total wager, with 10x for four mountains and 2x for three mountains, respectively. Finally, if you get at least 3 Mountain symbols on a single payline, this will activate the Free Spins bonus tool. This is an entertaining slot within the wild animal genre of poker games. The Sticky Wild feature adds to the variety and excitement and the slightly above average graphics are good enough to keep you playing for a while, but the soundtrack and sound effects will fail to encapsulate you so you never feel as if you are actually part of the game. Instead, this leaves you with the feeling that you are always just outside the action as if you are watching TV. The best slots pull you inside the action and make you live the challenges and exploits. Nevertheless, given how crowded the Native American – Wild Animal genre of slots is today, Winning Wolf is able to hold its own.